GUANACASTE, Costa Rica – When Hillary Bustos Gómez found herself pregnant at 16, she was not prepared for the challenges ahead. “The first months were the hardest. I couldn’t get used to the idea. ‘What am I going to do with a baby, all by myself? This cannot be happening to me’,” said Hillary, now 18. At least, she hoped, she and her boyfriend would raise their son, Mateo, together. “In the beginning everything was rosy, but things got worse over time. I never thought he would leave me,” she admitted. Still, Hillary managed to juggle single motherhood and high school. She even went on to study hotel management. But many young mothers are not so fortunate. 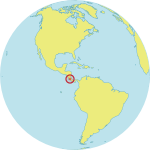 In Costa Rica, approximately 14,000 adolescent girls become pregnant each year, according to figures from the National Institute of Statistic and Census. Few of these pregnancies are planned, and the consequences are often detrimental. Pregnancy commonly pushes girls to drop out of school, which leads to worse outcomes for themselves and their families. 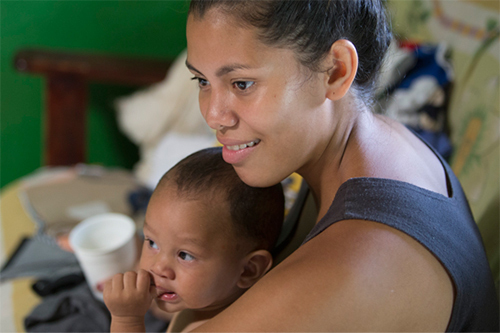 And the most vulnerable are the youngest mothers: Each year an average of 500 babies are born to mothers under 15, according to data from UNFPA in Costa Rica. Hillary was inspired by her experience to become a youth rights advocate. She began by joining the BA1 Project, which focused on reaching vulnerable girls. The programme – part of the Central America Security Strategy of the Central American Integration System, developed with the support of UNFPA and the International Organization for Migration and the participation of several government ministries – reached 765 adolescent girls and 111 adolescent mothers. The girls received training and counselling on women’s empowerment and rights, with special attention to their right to live free of violence. The adolescent mothers also received training and counselling on preventing further unintended pregnancies. Hillary proved to be a natural leader, gaining the trust of other adolescent mothers and becoming a group counsellor. Hillary has since been involved in other UNFPA-supported youth programmes, including a government-organized meeting of young women. And she is more motivated than ever to be a role model for other girls – and for her infant son.